After successful elections, leading Afghanistan expert calls on Russia and China to invest in the country like India has. Demographics have played a huge role in the transformation of Afghanistan into a member of the democratic states of the world, according to Shuja Nawaz, the director of the Atlantic Council’s South Asia Centre. “The Afghan people appear to have won another round with the Taliban and against the forces that want to derail the progress achieved by them – despite heavy odds – over the past decade plus,” Nawaz said. “All these factors have been evident in the manner in which the population defied the Taliban threats and voted this weekend,” he added. In the run-up to the election, the Taliban said it would violently disrupt the vote, which it saw as a “waste of time.” Dozens of attacks occurred across the country and several polling stations remained closed on election day due to security threats, yet the vote took place as scheduled. 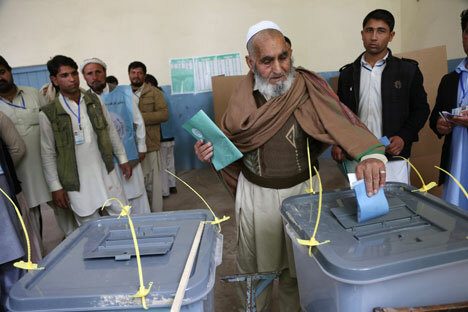 The United Nations Assistance Mission in Afghanistan (UNAMA) congratulated Afghanis on the election, which is largely seen as the country’s first democratic vote providing for the peaceful transfer of power from one elected president to another. "Ordinary Afghans turned out to vote in remarkable numbers, defying Taliban attacks and threats. Often in long queues and bad weather, voters patiently waited to exercise their basic human right to vote,” said Ján Kubiš, the UN Secretary-General’s Special Representative for Afghanistan and head of UNAMA. “They chose to determine the future direction of the country by political means and resolutely rejected the enemies of peace and democracy,” Kubiš said. The results will start to become clear in another week or so, but early indications seem to validate the various polls indicating that a runoff appears likely, with Abdullah Abdullah and Ashraf Ghani the likely candidates. “Regardless of who comes out ahead, and Ghani seems to have the early edge, the Taliban will need to find a new means to assert themselves,” Nawaz told RIA Novosti, adding that Pakistani Prime Minister Nawaz Sharif seemed committed to furthering ties with Afghanistan. “China and Russia will also have to step up their support and rather than competing for influence, [they should] compete to help Afghanistan. India already has invested close to $2 billion,” Nawaz said. Afghanistan’s new president will succeed Hamid Karzai, who has been in power since 2001 and cannot continue for a third consecutive term after having reached the constitutional limit of two terms in office. Preliminary results are scheduled to be announced on April 24. If no candidate wins over 50 percent of the votes, a runoff election will be held at the end of May.